One thing is for sure – the scrappy Paddy McKillen is not happy. A statement has been issued on his behalf this afternoon which is reproduced below in full, but it deals with two distinct matters. Last Sunday, the Sunday Times reported the temporary injunction that Paddy, along with controversial businessman Denis O’Brien, won at the High Court the day before. The injunction was granted in part because of the leaking of information to which Paddy has a right to confidentiality. It seems that certain confidential documents at Irish Bank Resolution Corporation were leaked, and the Sunday Times was about to run a story which the Judge believed could irrevocably damage Paddy. Paddy has now gone to the Gardai and good luck to him with that, they’re still examining the Moriarty Tribunal report with the Director of Public Prosecutions to see if they should launch a full investigation, and they’ve had that report for more than two years! The second matter is the subject of the reporting in the Sunday Times and Sunday Independent today, and the Freedom of Information request which revealed the Department of Finance had been courteous to the Barclay brothers in their communication with IBRC in respect of Paddy’s loans. Paddy claims there to have been a “surprising degree of cooperation” between the Department of Finance and the Barclays, and I would agree it was “surprising” that the Department of Finance could deal with communications promptly, knowledgeably and courteously, but I don’t think that’s what Paddy means! Urgent investigations are currently being conducted in order to determine the source of the improper and possibly unlawful release of selective confidential communications relating to Paddy McKillen. Taken out of context, this information could be seriously misleading. Mr McKillen has lodged a formal complaint with the Gardai and has instructed his lawyer, Paul Tweed, to take all appropriate legal action to identify the source of and reasons behind this extraordinary state of affairs, which may have ramifications for other customers of banking institutions. He will also be seeking the assistance of the Data Protection Commissioner and the Financial Services Ombudsman. Mr McKillen is also demanding a full explanation from the Department of Finance regarding what appear to be informal, supportive communications between the Department and Richard Faber, a Director of Ellerman Investments Limited, a company controlled by the Barclay Brothers. This documentation has only recently come to light following an Application under the Freedom of Information Act, and suggests a surprising level of co-operation between the Government and English competitors of Mr McKillen. This relationship is in stark contrast to the hostile stance taken against Mr McKillen, an Irish citizen who has created numerous jobs and paid significant sums in taxes, together with other extensive contributions to the Irish economy. Mr McKillen believes he is entitled to, and is seeking, full and complete disclosure of all communications of this nature. Not a single member of the old media reported the fact that Ireland is back in recession when the Central Statistics Office published economic data two weeks ago which showed that real GDP declined in Q3,2012 compared with Q2,2012 and that it also fell in Q4,2012 compared with Q3,2012. Both An Taoiseach Enda Kenny, who was touring the USA telling everyone of the Irish comeback and Helen McEntee, the Meath East candidate who was telling everyone on the doorstep that the economy was recovering under Fine Gael’s stewardship, should both send a giant “THANK YOU” card to RTE for keeping schtum about the inconvenient fact that we’re back in recession. Okay, the decline in GDP in Q4,2012 was quite small, in fact just 0.047% which when rounded to one decimal place, juuuust about is 0.0% which looks flat, but it’s not, it’s still a contraction. But what seems unforgivable is the failure of the old media to challenge the claim by this Government that the Croke Park 2 negotiations – aimed at setting the pay and allowances and conditions of public sector workers for the next three years – have reached a proposed agreement which means that higher paid workers will see bigger cuts than lower paid workers. The headline might be that those on over €185,000 will see their salaries cut by 10% whilst those on less than €65,000 will be left untouched, but this is utterly misleading. Those on €185,000 will see a €13,150 cut which is a 7.1% cut, and that’s because the cuts are graduated, the first €80,000 is cut by 5.5%, the next €70,000 is cut by 8%, the next €35,000 is cut by 9% and the excess over €185,000 is cut by 10%. For instance, the salary of An Taoiseach Enda Kenny will be cut from €200,000 to €185,350, a cut of €14,650 or 7.33%. And what about the lower paid? Firstly, what is lower paid? At the risk at upsetting our British friends, and let’s not forget that Britain has contributed €4bn to the Irish bailout, there are two main thresholds advanced in Ireland for “lower paid”, the first is a gross salary of €100,000 (GBP 84,782) and the second is €65,000 (GBP 55,108). In Croke Park 2, this Government has been claiming the effect on pay and allowances of those earning less than €65,000 is nil, zero, nada. On 12th March, 2013 Minister for Public Expenditure and Reform, Brendan Howlin was asked to show the effect of Croke Park 2 on the “gross salaries and allowances” of those earning less than €65,000 and the Minister responded that those earning less than the €65,000 would see no change to their gross or net pay! Just before Easter, Minister Howlin was again asked about the effect of Croke Park 2 sub-€65,000 pay and allowances, and this time he was more guarded and said 87% of those whose “core pay” was less than €65,000 would see no change. There was no detail forthcoming on reductions to the other 13%. Contrast the Minister’s claims with those of the 24/7 Frontline Alliance, the new umbrella union which is representing those in the Gardai, prison offices and some medical workers. They’ve engaged a firm of actuaries to work out the effect of Croke Park 2 on the gross salaries and allowances of a range of workers, and this is what they found. There are a range of reductions from 3% for firefighters to 11.4% for a staff nurse. No average is given but the modal reduction is 5-10%. They throw in the salary of a senator for comparison to show that those just over €65,621 will see a reduction of €621 or 0.9%, which makes the bald point that some politicians are escaping lightly. In fact, TDs earning €92,672 will see a reduction of €5,414 or 5.8% to €87,258. That’s less than a psychiatric nurse whose pay will decline by €5,441 or 11.1% from €48,860 to €43,419. How on earth then, is the Government getting away with the claim that Croke Park 2 will see larger cuts from higher salaries than lower salaries, and worse, that those on pay and allowances of less than €65,000 will see no reduction? I don’t know the answer, but if the old media can’t bother to tell the nation that we’re back in recession, then ignoring this sort of detail is predictable. Here are the two parliamentary questions referred to above. Deputy Mary Lou McDonald: To ask the Minister for Public Expenditure and Reform if he will provide in tabular form, the number of public sector employees who will be subject to the provisions of the so-called Croke Park two agreement whose salary and allowances fall into the following bands less than €65,000; €65,000 to €150,000; €150 €185,000 and more than €185,000 together with the estimated pre-Croke Park two 2013 gross salaries and allowances, 2013 net salaries and allowances after tax and deductions and the post-Croke Park two 2013 gross salaries and allowances, 2013 net salaries and allowances after tax and deductions. Minister for Public Expenditure and Reform, Brendan Howlin: The closest data currently available within the Department to that sought by the Deputy is the estimated breakdown of employee numbers on a whole time equivalent basis (based on a whole time equivalent figure of 292,000) by salary range within the public service is set out in Table 1 below. The impacts of Income Tax, Universal Social Charge, Pension Related Deduction, Employee P.R.S.I. and Pension Contributions have been based on the mid point of the relevant salary range and are included in the Table also. Estimates are based on a single individual subject to social insurance deductions under Class A. Deputy Mary Lou McDonald: To ask the Minister for Public Expenditure and Reform further to parliamentary Question No. 249 of 12 March 2013, if he will provide a reconciliation between the 0% change he claims will occur to the gross salary and allowances of staff earning less than €65,000, with 10.63% reduction which the 24/7 Frontline Alliance claims will occur. Minister for Public Expenditure and Reform, Brendan Howlin: The proposals put forward by the Labour Relations Commission on 25th February last are a fair and equitable package of measures which will deliver the €1bn savings in the pay and pensions bill required by Government, while protecting those on lower incomes to the greatest extent possible. For example, under the proposals, there is no change to the core pay of the 87% of workers in the public service who earn less than €65,000. In contrast, those on salaries over €65,000 will have their pay reduced by between 5.5% and 10%. 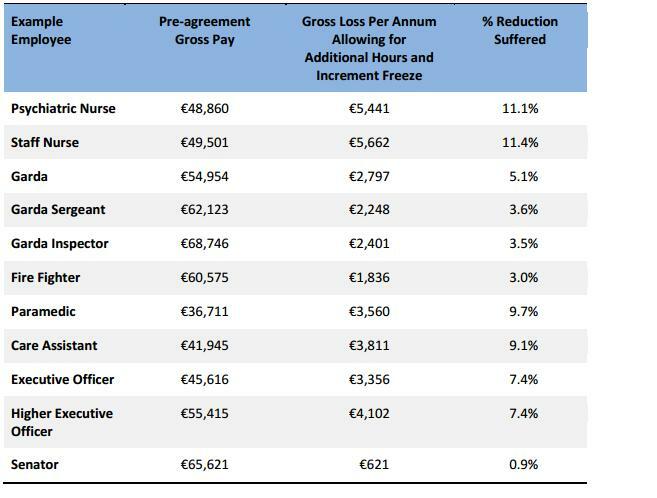 In the case of those with salaries greater than €100,000 salary scales will be permanently cut by the relevant percentage. This was illustrated in the table included in Question No. 249 to which the Deputy refers. I am not aware of the basis for the figure of 10.63% referred to by the Deputy. However, I would again reiterate that the proposals emerging from the negotiations represent a fair and balanced deal, which protects the core salaries of the vast majority (87%) of public servants. Funny how Minister for Finance Michael Noonan and his Department of Finance resign themselves to being “powerless” onlookers towards the banks in which they have controlling or substantial interests, when challenged by the Opposition, but as revealed in the Irish Sunday press today, they are portrayed as assuming the role of power-broker when contacted by billionaires. Both the Sunday Times, which is embroiled in an injunction row at present with developer and businessman Paddy McKillen, and the Sunday Independent today report on contact between representatives of the billionaire Barclay twins and the Department of Finance. The Barclay twins are vigorously pursuing control of the three Maybourne hotels in central London, Claridge’s, the Berkeley and the Connaught; Paddy McKillen owns 36% of the company controlling the hotels, the Barclays own 28% and there is a tussle before the British appeal court at present about control of Derek Quinlan’s 36%. Paddy has gotten hold of Department of Finance emails under Freedom of Information requests and is predictably unhappy, though there is something of the pot and kettle here, with Paddy having previously written to An Taoiseach and others in government in May 2011, making representations to stop his loans being acquired by NAMA. Minister Noonan said his office passed those representations on to NAMA, which subsequently decided not to acquire Paddy’s loans. So here you have Paddy in May 2011 making his own representations to government, but when the Barclays do something similar six months later, Paddy starts whinging. Paddy’s spokeswoman is quoted as saying “Mr McKillen is demanding a full explanation from the Department of Finance regarding what appear to be informal, supportive communications between the department” and the Barclays. Paddy is reportedly unhappy with the Department staff and is making noises about breaches of the Ethics in Public Office legislation. There is a claim reported arising from “sources” that if IBRC had sold Paddy’s loans to the Barclays then the Irish taxpayer would have faced multi €100m losses. I would take that claim with a giant pinch of salt, and indeed it remains curiously unclear why IBRC didn’t progress talks with the Barclays on Paddy’s loans – which are a gateway to control over Paddy’s shares in the hotels – because ultimately, IBRC could have made the sale of any of Paddy’s loans conditional on the buyer buying ALL of Paddy’s loans at par value. The tax payer could have been in clover if a deal had been done on the right loans at the right price. For once, there is sympathy on here for John Moran. He is being hounded by the Sindo at home and on his mobile for comment – don’t be surprised John, if the Sindo feature your family life next week. After all, John received communication from a serious buyer wanting to buy Irish state assets – loans at IBRC which was 100% owned by the Government are “state assets” – and he seems to have responded in a helpful and facilitating manner, though there is nothing in the emails which suggest shenanigans. What was he supposed to have written? There is actually some relief on here that John recognized the Barclays were serious buyers, and that he did promptly pass on messages to IBRC, and he treated the Barclays with courtesy. By the way, just around now, Paddy McKillen should be in intensive talks with the special liquidator at IBRC about refinancing his estimated €300m personal and €550m corporate loans, which will otherwise be offered for sale and the Barclay brothers have let it be known that they may be prepared to offer a premium for those loans above their market value. Paddy made the Freedom of Information request on 8th March 2013, a month after the announcement of the IBRC liquidation and when it became clear that loans would be offered for refinancing before being offered for sale on the open market. So, here you have the Department of Finance coming under pressure from Paddy with threats of referrals under the Ethics in Public Office legislation at the same time as IBRC is considering refinancing proposals. Normally liquidators are independent and protect the rights of all creditors, but the IBRC liquidation is “special” and Minister Noonan and the Department of Finance control the liquidation through the IBRC liquidation Act. All a coincidence, no doubt.